As we continue our love for street food – exploring the new while revisiting the old, I chanced upon some old photographs of some of us at Vijay Chaat enjoying ‘çoconut patties’. As nostalgia sets in and I am taken back to the euphoric time I had with my friends, I try to recall the street food delicacies we had enjoyed! Unfortunately, food photography and this blog weren’t on my agenda, hence I don’t have any shots of the yummilicious food. As I take a trip down nostalgia street, I am so delighted to share what I remember of that trip with you. It’s almost like eating that food again. By the way, I learnt the Indore Poha recipe which I shall share with you. 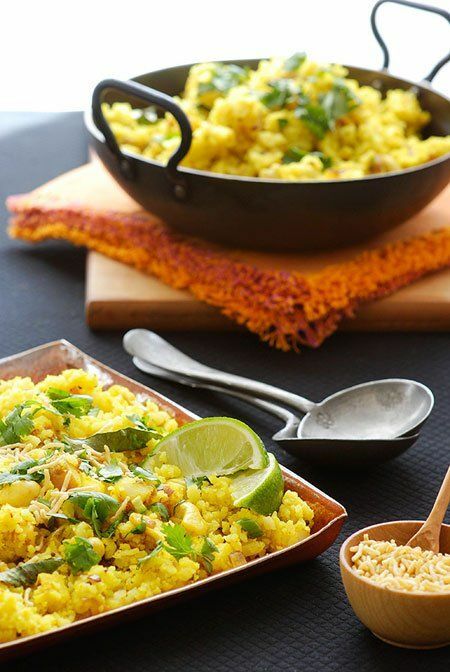 It’s a tad different from the way I used to make Poha at home – simple, yet bursting with flavour! The list of street food that one needs to try is fairly long, and unless you don’t let your taste buds control the amount of food you consume as you start, you won’t be able to taste everything in a day. 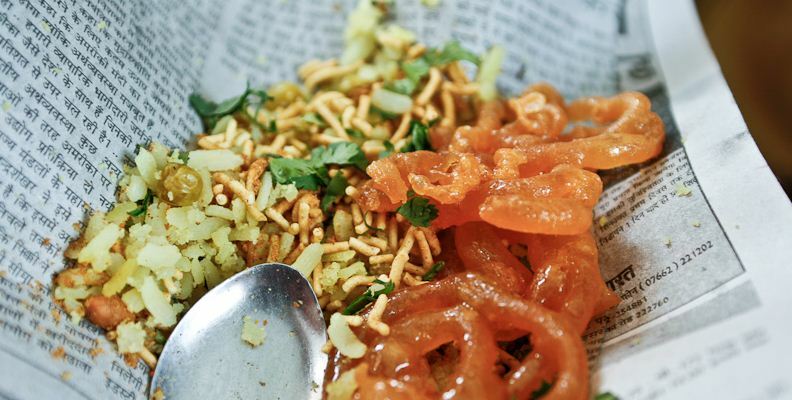 First up on my list, a hot favourite is Poha-Jalebi. 1. Poha-Jalebi – this is an odd combination when you hear it for the first time, but it works like magic! 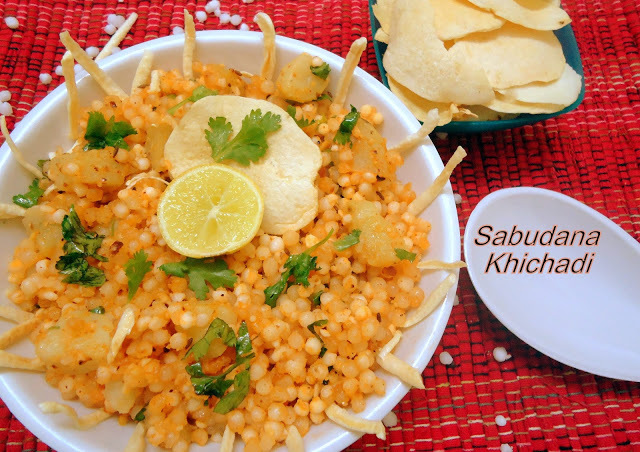 A sweet and tangy flavour, the poha is very soft and light. Simple ingredients make this beaten rice dish delectable. 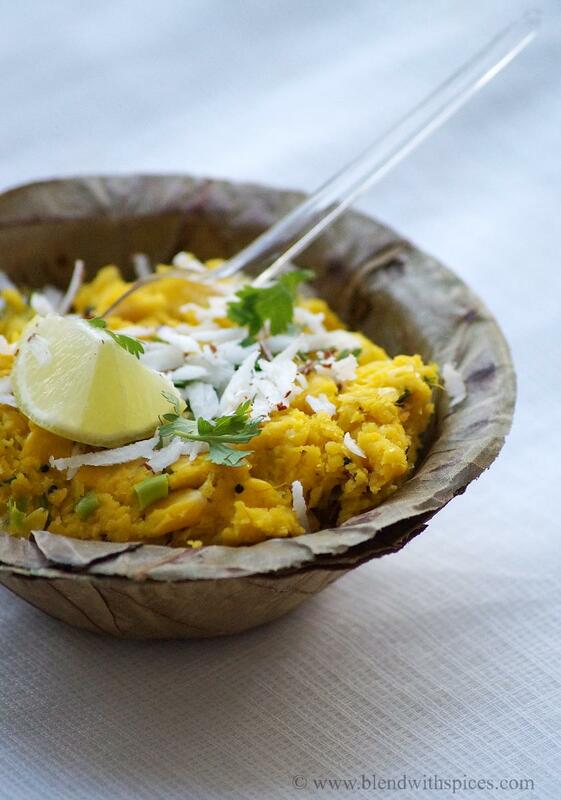 A perfect blend of flattened rice, curry leaves, fennel and mustard seeds, grated coconut and salt+sugar to taste. Don’t skip the sugar. It is a mandatory for the flavour. 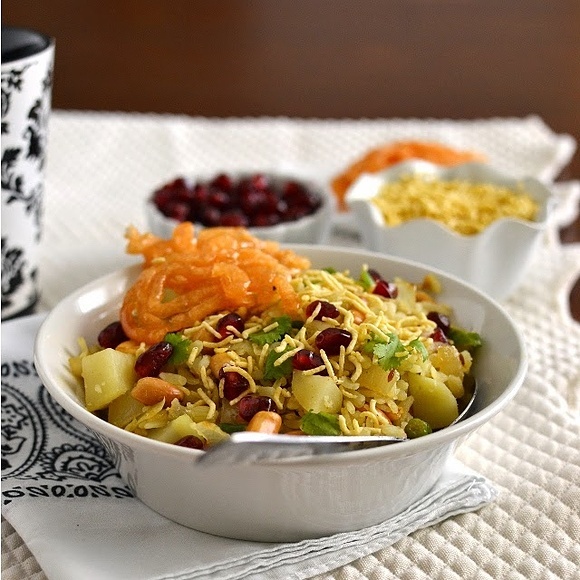 Garnish with some pomegranate seeds and sev/ gathia – whatever is handy. 2. 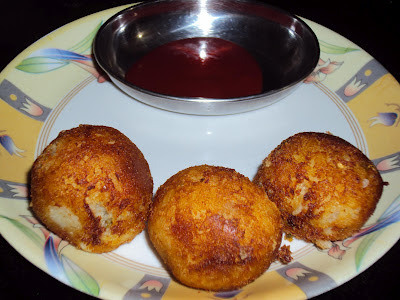 Egg Benjo – I was pretty clueless why it is called Egg Benjo, but this Indori Street food is basically a crisp, hot omelette (red in colour because of the chillies) in a warmed and sliced soft bun. Here’s something interesting I read. According to wiki, “During World War 2, a popular filling snack with British troops was an “egg benjo”, a sandwich of 2 thick slices of bread (buttered or with margarine where possible) enclosing a runny fried egg, accompanied by a mug of “gunfire” (hot, strong, sweetened tea with milk). The term ‘Banjo’ coming from the actions taken when one bit into it. The yolk would drip down onto ones chest, and the sandwich would be held out to the side with one hand whilst the other hand would rub at the drips using the fingers. This gave the impression of playing an invisible banjo. Something similar to the ‘bread-omelette’ fare, yet distinctly different. Johny Hot Dog in Chappan Dukan dishes out this delicious treat to over 500 people in a day! I tried doing this at home, but couldn’t get myself to smear so much oil on the buns and the egg! It’s easy and quick to do, so if you are in a mood – beat eggs, coriander or cilantro, cumin seeds, ginger julienne, red chillies (green if you like this extra hot), turmeric, salt and pepper. Heat a skillet and drizzle some oil. Pour the eggs, cook the omelette, slice it into three pieces and place it between sliced, warm buns. 3. Indori Shikanji – It is not the ‘nimbu-pani’ or ‘lemonade’ you expect. 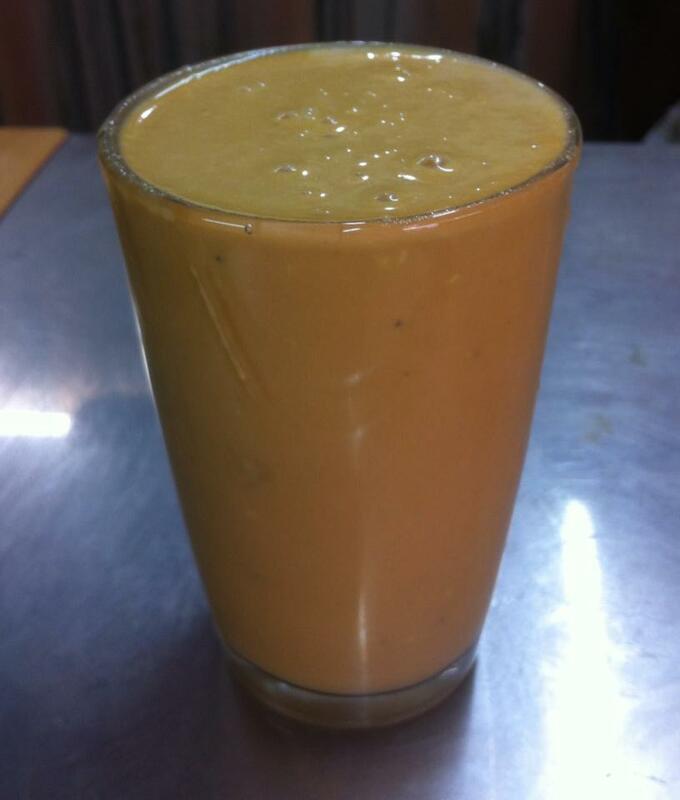 It’s the royal shikanji made with milk, sugar, saffron, cardamom and a host of dry fruits! It’s served chilled and for people who enjoy this very heavy drink, it’s blissful! I didn’t try it, but my friends who did, couldn’t stop raving about it! 5. 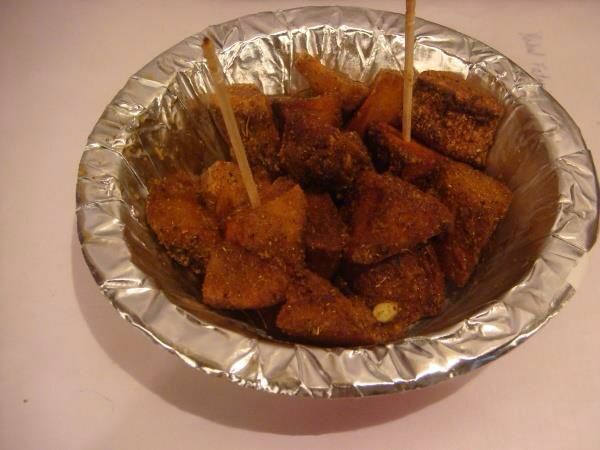 Bhutte ka kees – This is an Indore speciality. It is basically grated corn on the cob, cooked with milk, curry leaves, grated ginger, mustard seeds, turmeric powder, asafoetida, fresh coconut and lemon juice. It has the consistency of halwa and is typically eaten by itself without any accompaniments. Get the recipe here. 6. Garadu chaat – If you don’t have an aversion to Yam, definitely try the Garadu Chaat at Sharma Chaat House. Try this recipe by Sanjeev Kapoor if you like to make some at home. 8. Badaam milk – Lakshminarayan Doodhwala makes this incredible recipe with Badaam Milk. The wide kadhai at the corner shop is visible from far and the milk doesn’t stop simmering, making it very thick as time progresses. With so much on offer, I chose to skip this milk and hopped to Ice-creams straight away. 9. Ice cream at Monica Galaxy: I am a big ice cream buff, and any form of ice cream would do for me. I make it a point to try ice cream wherever I go (be it Snowy Scotland or Ice-cold Canada!). Indore was no exception, and I had to try out the Ice-cream at Monica Galaxy since we were already in Chhappan Dukaan. 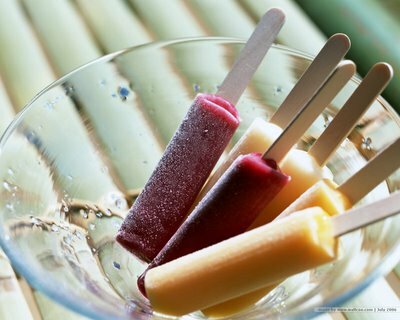 You are spoilt for choice with the shop serving over 100 varieties! The Kulfi was delicious with lots of nuts (I don’t enjoy falooda at all, hence I skipped it). The ice-candies were almost calling out to me, so one for the road I said to myself and picked up a Fiesta Bar! Slurpalicious! I am actually inspired to make Poha and Egg Benjo for breakfast for my family. Simple and straightforward, quick and delicious and always hits the right notes with me. Indore, we love your food and we hope to see you soon again, for more! Hello, thank you for your information, Keep it up….. Thank you. Very grateful that you are enjoying our posts.